Here at Little Valley we’re all about inclusivity. We pride ourselves on our range of beers that offer something for all tastes, so our core beers cover a diverse spectrum of beer styles. From a light wheat beer to a dark porter and everything in-between, we brew a beer to suit you. Let’s start at the light-coloured end of the scale with Hebden’s Wheat, a Belgian style wheat beer. It’s our award-winning take on the continental classic and is a refreshing, spritzy beer with hints of coriander and lemon. A brilliant beer match for lighter foods such as fish it’s also a fantastic partner to a spicy curry, where the beers fruity sweetness will temper the chilli heat and the carbonation will cleanse the palate between bites. Like all our beers it’s available in bottle and draught. Staying light in colour but not in flavour, Withens Pale is, well, a pale ale. This style developed in Burton on Trent during the 18th and 19th century and is, after lager, arguably the most consumed beer style in the UK today. Withens uses the refreshingly floral Cascade hops and there’s hints of spice, orange and citrus that delivers a delicious dry, bitter finish. The pale ale family of beers includes India Pale Ale (IPA) which are traditionally the strongest, most highly hopped versions, originally brewed in the UK to withstand the long voyage to India and quench the thirst of the Raj. Our Python IPA is straw coloured with a perfect balance of malt sweetness and hop bitterness. Try it with a hearty stew or a generous chunk of Cheddar. 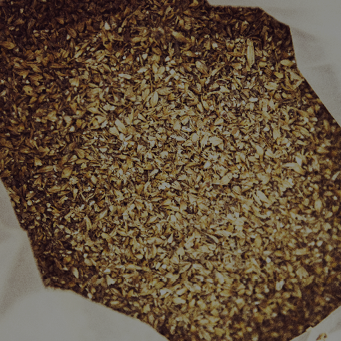 Our third pale ale is the Radical Roots (formerly our Ginger Pale Ale) which we brew with, you guessed it, ginger. It’s a fresh, citrusy ale that makes a delicious aperitif and it’s also the only beer in the UK that’s Fairtrade certified. Try it with a spicy meal. 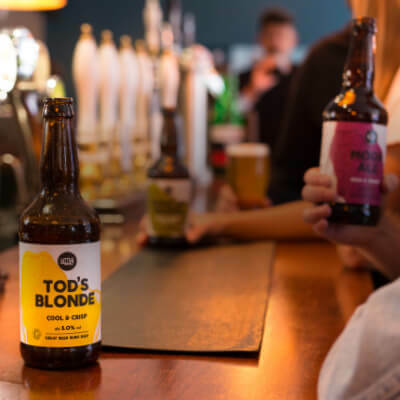 Another of our beers that could be classed as a pale ale (because it’s pale in colour) is Tod’s Blonde (actually a blonde ale). It’s light, bright and a good alternative to lager and a brilliant beer pairing for fish and chips. Blonde ales are very pale with subtle hop and fruit aromas. Our bitter, Cragg Bitter, is a medium-full bodied beer that’s crisp, fruity with a clean bitter finish. Bitter is an ale style brewed throughout Britain, traditionally cask-conditioned. They are termed ‘bitter’ to distinguish them from mild and brown ales. ‘Best’ bitters have traditionally been the brewers mainstay brand while ‘special’ bitters tend to be stronger or with particular ingredients, and we brew one of those too! Moor Ale is our beer inspired by and dedicated to the Yorkshire Moors. It’s red brown in colour and has smoked peat flavours and hints of moorland heather. Our very own unique take on an extra special bitter (ESB). We started off light with Hebden’s Wheat and so we end in the dark with our porter and stout. Originating in the 18th century trading ports of London and Dublin, porter and stout use hard water, dark malts and barley, and copious hops to create distinctive near-black beers. Our Dark Vale (formerly our Vanilla Porter) is rich and lightly roasted and its subtle hints of vanilla stem from the real vanilla pods and ground vanilla we use in the brew. It’s a brilliant beer and the best beer match for apple crumble. Stouts were traditionally the stronger version of porter (stout means big) but today the line between the two is fuzzy. 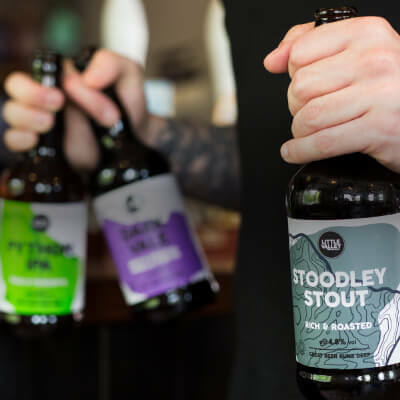 Our Stoodley Stout is brewed using chocolate and crystal malts that are mixed with oats and wheat, which create a creamy, roasted flavour with notes of orange and citrus. Pairing the chocolate notes in the beer with a chocolate pudding is indulgent beer and food heaven! So whether you fancy a light beer on a summers day (or winters day), a glass of cask-conditioned bitter, an alternative to lager or the darkest beers of them all, Little Valley has you covered. Whatever your taste or palate, we brew beer that’s just right for you. Oh, and they’re vegan friendly and organic too! We’re on the hunt for the best views of Yorkshire taken from beer gardens! Little Valley Welcomes Le Tour de France 2014!